Facts On T-Shirts: Here are a few surprising fun facts and trivia about the t-shirt that you should know. Learn facts on Guinness World Record on the t-shirt to the textile industry. Learn the year it first started and its popularity in the USA. Know the most popular fabric used to more about golden t-shirts. 1) The first promo t-shirt was produced for The Wizard of Oz in 1939. 2) Coca-Cola did the first T-shirt brand promotion, especially in the 80s. 3) F. Scott Fitzgerald was the first to coin the word t-shirt in 1920 in his novel, This Side of Paradise. 4) The first company to embellish t-shirts was Tropix Togs. As a matter of fact it printed t-shirts with pop culture icons which lead the way to customizing t-shirts. 5) In 1904 the t-shirt was first produced and marketed by Cooper Underwear company, hence they were called long underwear. Whereas t-shirt emerged simply by separating the top and the bottom half. 6) T-shirts first entered into pop culture in the 70s which grew into popularity in 1980s. This was also the time when wrinkle-free t-shirt was born. 7) Movie stars such as Marlon Brando, John Wayne and James Dean popularized t-shirts. Until then, they were still considered as underwear. 8) Cotton production is continuing for over 7000 years. However, in Mehrgarh city the use of cotton was first found. 9) Currently, China and India are the two largest producers of cotton in the world, most of all with nearly 60 million sales per year. 11) A variety of materials are used to make the t-shirt, along with leather, gold, and even human hair. 12) In 1905 t-shirt consequently became the U.S Navy’s uniform. 13) Until 1930, t-Shirts were labelled ‘Skivvies’ and ‘Jim Shirts.’ Back then t-shirts were much lighter weighing just 1.5 to 2 ounces. 14) The invention of plastisol in 1959 made a variety of t-shirt design possible. It was also durable and flexible than other ink used. 15) Did you know that as much as 2 Billion t-shirts are sold worldwide every year. 16) Did you know the world’s costliest t-shirt is marked at nearly $400,000. While it has 16 diamonds sewn into the material. 17) Rock and Roll bands in the 60s also popularized the custom screen printed t-shirt. 18) The oldest textile printing method dates back to 3rd century China, it was woodblock printing. 19) The credit for the oldest t-shirt slogan print goes to the presidential campaign of New York Governor Thomas E. Dewey. 20) Originally t-shirts were a type of clothing meant only for men, as a result, it was popular among men for decades. 21) The US Army receives millions of t-shirt donations per year. 22) The Guinness World Record for the most t-shirts worn is “257”. Whereas, together they weighed over 200 pounds. 24) A man named Datta Phuge owns a shirt made of more than 3 kilograms of solid gold. It’s worth nearly $250000. 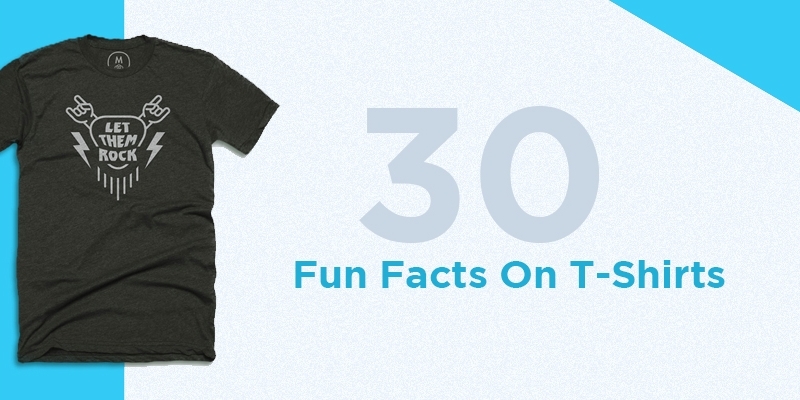 25) Did you know that the world’s’ largest t-shirt is nearly 300 feet long and also 200 feet wide. 26) United states houses as many as 35000 cotton farms and consequently employ enough people to fill 4 football stadiums. 27) Nearly 60% of American have more than 10 t-shirts, which is enough to circle the early 34 times. To make a full circle around the world, you will need nearly 56 million t-shirts. 28) The second most popular fabric for a t-shirt is Polyester after cotton. 29) It takes 6 miles of yarn to make “1” t-shirt but only 1 acre of cotton field to make nearly 1200 t-shirts. 30) International t-shirt day is on June 21st.